Michael Ingold is an interdisciplinary artist whose work is focused on the intersection of two-dimensional and three-dimensional media utilizing both traditional forms of wood-working as well as contemporary digital fabrication and design methods. Born in 1980 in Detroit, Michigan, he spent much of his youth throwing himself down stairs on a skateboard. His joints now ache and he regrets it a little. 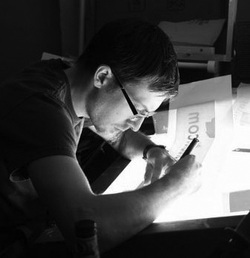 He received his BFA in 2004 From Grand Valley State University with an emphasis in sculpture. After completing his BFA Michael served as the Exhibits Manager for the Grand Rapids Children's Museum where he was the lead designer and fabricator for all exhibits. In 2009 he received his MFA in painting from Kendall College of Art & Design. From 2010-2013 Michael was an Assistant Professor and Visiting Artist at Grand Valley State University teaching in the Foundations and Drawing departments. In the summer of 2013 Michael and his family made the trek down to Tampa, Florida where he is now a Lecturer and the Studio Technician for the Art Department at the University of Tampa teaching primarily in the Foundations department. When he is not teaching and making art Michael enjoys playing his guitar loudly, much to the chagrin of his wife and children. All images and content copyright Michael Ingold 2003-2018.